Lex Albrecht is a professional Canadian road cyclist. 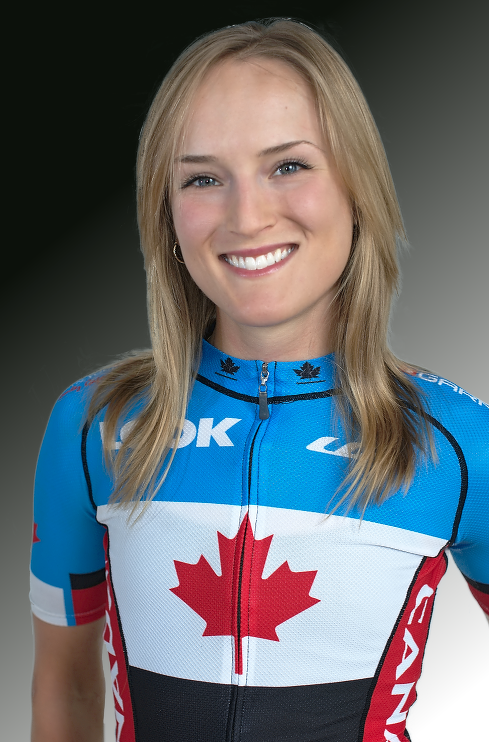 Lex is a member of the Canadian National Cycling team, and the UCI Women's World Tour team, TIBCO-Silicon Valley Bank. She is a 8 time CHAMPION OF QUÉBEC, 3 time podium finisher at the Canadian National Championships, and has represented Canada on 3 occasions at the World Championships, and other prestigeous international events. Raised in Barrie and Oro-Medonte, Canada, Lex moved to the province of Québec at the age of 18. There, she became proficient in French and studied Medical Biology (Biologie médicale) at the Université du Québec à Trois-Rivières. Lex worked as a research assistant at the Institut National de la Recherche Scientfique (INRS-Institut Armand-Frappier). Lex is now based in Montréal, Canada and trains at the P2 Performance Studio in Montréal. Lex began racing in 2009. Her first international cycling competition was the World Cup race in Montréal, followed by the Tour de PEI, and the Tour Cycliste Féminin International de l'Ardèche. She represented Québec at the 2009 Canada Games. Lex races full time throughout North America and Europe. She has raced in Canada, USA, Belgium, France, Germany, Italy, Sweden, Spain, Czech Republic, Argentina and the Netherlands. In 2011, Lex was a member of Canada's only women's UCI cycling team, Juvéderm-Specialized Mazda. In 2012 she raced for Optum Pro Cycling presented by Kelly Benefit Strategies, the #1 team on the North American race circuit (NRC). In 2013 she was the 11th overall in the American classification, when she raced with the American professional team, NOW and Novartis for MS. The following year (2015) when she raced for TWENTY16 Pro Cycling, she was ranked 2nd in the world, of all Canadian road cyclists in the UCI points classification. Lex returned to race with Optum Pro Cycling in 2015. Lex currenty races for BePink, an Italian registered professional UCI women's racing team. In 2012, 2013, 2014 and 2017 Lex represented Canada at the World Championships. Lex is a spokesperson for the Fondation Charles Bruneau. She has been a member of Toastmasters International (public speaking club), enjoys cross country skiing in the winter as an excellent means of cross training, and appreciates great coffee when the moment is right. She is a fan of motorcycling, and enjoys mountain biking in the off-season. Lex is adamant about being active in the community and participating in causes that help children, especially. Through striving for athletic excellence, Lex maintains her passion for cycling. A fan of exploring new roads, competing in new races, and never passes up the chance to be reacquainted with the people she pedaled alongside on her path to becoming a professional cyclist.